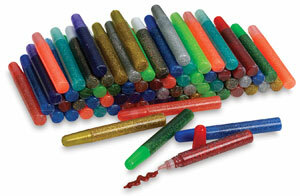 This bargain class pack holds 72 resealable 10 cc tubes of non-toxic glitter glue. Tubes are easy to squeeze for small or challenged hands. There are 12 assorted iridescent and bright colors.